High precision instrument. Accuracy better than 0.5 mGal. Straight line sensor without Cross-Coupling effect. Possibility of highly accurate and linearized measurements for up to 0.23 g (230 000 mGal) of vertical acceleration. Short recovery after profile changes if navigation data are available. Valuable readings during turn-manoeuvre if accurate navigation data are available. Operation at different sea states will be ensured by selection of appropriate filtering. Measurements are made possible even at rough sea conditions. Safety precautions for sensor and gyro platform in case of power breakdown. Display and visualization of monitor data and status. NMEA-link to navigation and other marine instruments. Data from echo-sounder (if available). Data from magnetometer (if available). Power rating 400 VA max. 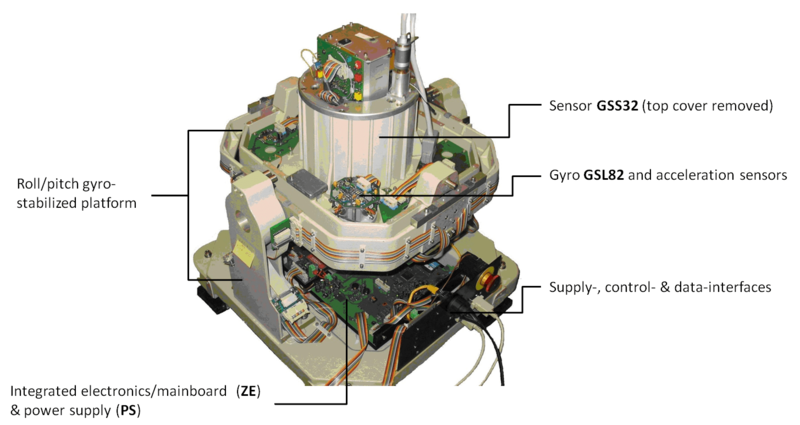 The axially symmetric spring-mass arrangement at the STRAIGHT LINE SENSOR of the BGGS KSS32(-M) gravimeter is shown schematically. A 36g TUBE-MASS is constrained to move vertically, so in contrast to a horizontal beam system, the sensor is essentially not influenced by cross-coupling between horizontal and vertical accelerations, e.g. of the vessel. The displacement of the tube is measured by a CAPACITIVE TRANSDUCER at the top. Motion is minimized by a feedback loop consisting of two windings of a COIL moving in the field of a strong permanent MAGNET at the bottom of the tube. Gravity changes are derived from currents generated in the moving coil.